They were doing so well. Van Dijk had flicked the first goal home from an angle in the 38th minute for a well deserved lead. After the break poor Harry Lewis dropped a bit of a clanger, born out of inexperience. He gave away a bit of a no-brainer penalty to level the scores. Saints then regained the initiative with a brilliant header from Maya Yoshida. In the second minute of the five added at the end of normal time, Saints went to sleep allowing Naismith to hammer the ball beyond Lewis, who had no chance and it sent the tie to a replay at St.Mary's on the 18th January. Well, where do I start here? The first surprise was in the team selection. Young Harry Lewis was in goal. He looks really young, does he play for the U12's? Which rather begs the question, if you are not going to play Forster, McCarthy is still injured and then Lewis is preferred to Taylor, then how bad must he be? Why was he signed, if you are not going to play him? In front of Harry Lewis, Stephens was at right back, Bertrand at left, with Yoshida alongside van Dijk, who was back from injury. The midfield was Harry Reed, Højbjerg and JWP. Up front were Sims, Long and Tadić. All perfectly good enough to beat Norwich, but my only worry was Lewis's inexperience. However, if you don't play, how do you get experience? Before van Dijk's opening goal, there were several chances. Tadić hit a sizzling free kick that McGovern, the Norwich goalie, managed to palm away. Long had a point blank header tipped over as well. The common thread with all these moves was the accuracy of Tadić's crosses. After his return from the nose/cheek injury, I thought he had looked a bit tentative, but he was back to his best here. So, we arrived at half-time 0-1 to the good and playing well. The second half started with Saints fans feeling positive about the team. That lasted five minutes. Van Dijk, under pressure sent a long pass back to Harry Lewis from outside the penalty area. Cameron Jerome set off towards Harry, who didn't control the ball well. In a flash Jerome was between Lewis and the ball. The Saints goalie tried to go for the ball, but only succeeded in bringing down the Norwich No.10. Penalty. Whittaker duly converted and it was all square again. 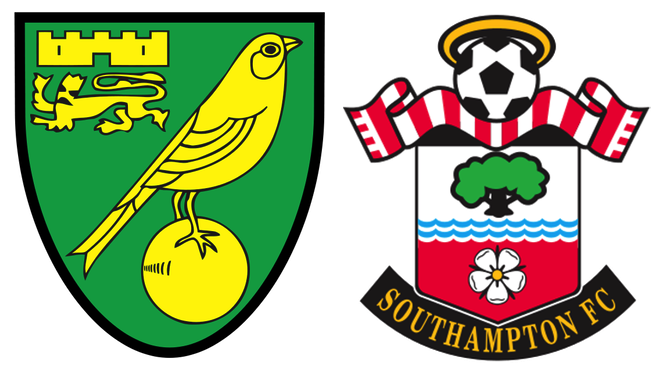 The chances continued to come for Saints, with the ball at one stage flashing across the Norwich goal and two red and white striped players completely failing to connect. The ball found it's way back to van Dijk who thumped a shot, which McGovern did well to palm over. Eventually Højbjerg, who had been having a good game and looked more like the player we all thought he was, sent in a beautiful cross from the right touchline and it landed on the head of the onrushing Yoshida and all McGovern could do was pick the ball out of the net. 1-2 and in control. Unfortunately, it didn't stay that way. Chris Kavanagh, the referee had added five minutes of extra time and in a moment of aberration that we have seen far too often this season, the ball was whipped in from the right, to find Naismith completely unmarked in the penalty area and he nodded the ball into the top left corner, well out of Harry Lewis's reach. In spite of chucking away the win, there will be a second chance back at St.Mary's on the 18th. As someone said, this was a case of baby steps, getting back to the team we know is in their somewhere.